We will see more frequent confused users as the programs diverge. One immediate area is that the current valentina project page still has pointers to dismine’s executable files, even for the new/developer/unstable versions. which as you see is still then end of a build process that dismine probably does not (and does not need to) pay much attention to. for ubuntu users (like me) it is reasonably easy to enable a specific ppa to be included with regular periodic system updates and ignore it. 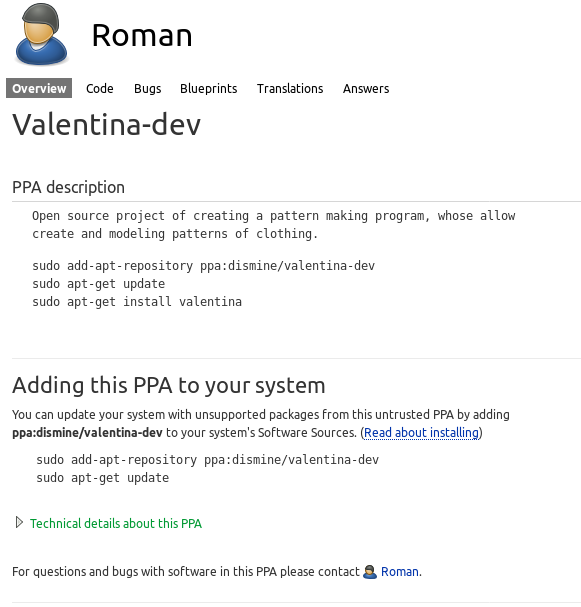 until or unless you remove the OLD ppa, you will continue to get updates which will invisibly modify the valentina version which you run. so, it may be important to distinguish the appearance of the desktop icon or at the very least be aware of how to tell versions apart. We don’t have our own builds yet. This isn’t a problem, we’re working towards this goal. When we have builds for these distributions, we will change the links. If he pulked the latest code on develop and built then there will be a difference. You and I will make the first build to start to deconfuse this situation. Well… currently I have 5 versions sitting on my desktop. Yes… I built from the Github code… which I assume is the same as the last test build on the Project site? In any event, I could not open a pattern Grace attached with my build or the last project site test download… until I realized Grace was using Dismine’s latest build - which I dl’ed from his Bitbucket. i just got the power cord for my new 8GB laptop -which except for storage capacity is more powerful than my home desktop tower computer. I have spent the day dealing with various personal obligations and loading up the laptop. I probably have the same 5 versions on the desktop but decided not to do builds here… because I have had so many self inflicted foot wounds in the last few years because I tinker with the linux configuration and have been through plasma desktop version 3, 4, and 5. I have figured out where to stash everything on other drives so I can rebuild but it gets tiresome. So… by the weekend I will be in a position to start doing builds. I have not looked into the workings of appveyor. Have you? I know that after all the forks, tinkering, commits that dismine does a build that results in new versions of executable code for all of the platforms.